All Saints Murrumbateman was built in 1919. 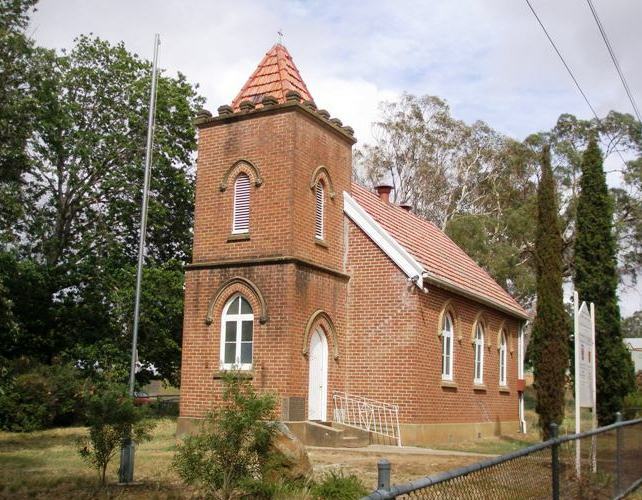 In 1876 the Presbyterian and Anglican Churches combined to build the “Scots Church” in Murrumbateman, the Presbyterian Church later purchased the Anglican share of the property. The building of All Saints’ Soldiers’ Memorial Church began in 1918 and consecrated on 27 April 1919 by Bishop Radford, the foundation stone being laid by Brigadier-General Parnell. The church, comprising nave, chancel and sanctuary, tower and vestry, is made of brick with a tile roof. It was built mainly by the generosity of Mrs. G. M. E. Vallance (Susannah). Mr and Mrs Vallance resided at “Hillview” for many years before moving to Sydney in 1936. The bricks for the church were made on “Hillview” and most of the construction and furnishing was provided by the family. Beautiful stained glass windows adorn the sanctuary in memory of Susannah Vallence. An Honour Roll inside the church commemorates the 60 young men from the area who enlisted for service in World War 1, nine of whom lost their lives in that conflict. Congregation numbers have followed the fortunes of the district, and have been growing in the last 10 years. During this time All Saints has been lovingly restored, and works to balance historical heritage and modern preferences.